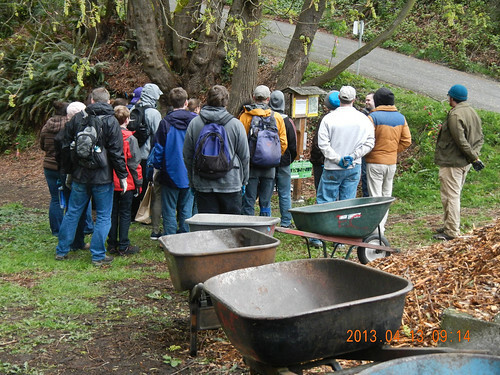 Last Saturday (April 13), EarthCorps joined Friends of North Beach Park for what was the first of four work parties that will happen in 2013. It was a great start to our third year of restoration. 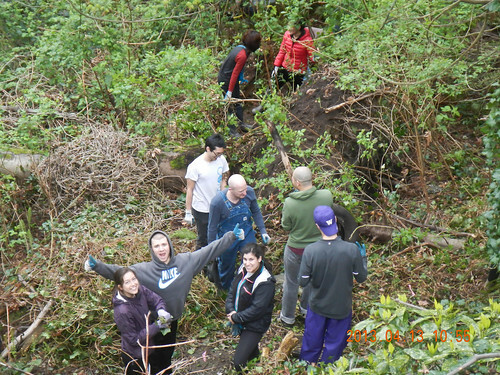 EarthCorps brings in a crew, supplies, tools, and experience. Lots of groups looking to do community service go to their website, so their events usually have good turnout. 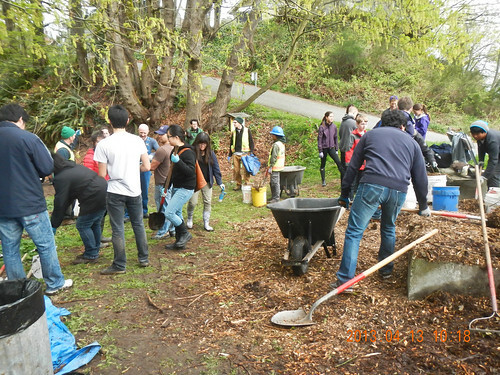 We had about 50 volunteers, making this twice as big as the next-largest work party that North Beach Park has ever hosted. Here’s the crew (left to right): Jessa (Philippines), Masha (Russia), Alex, Ethan, and me (USA). The official start of the work party is 10 a.m., but for the EarthCorps crew it’s a lot earlier. Their day starts about 7, loading the trucks and vans at EarthCorps headquarters. (For an event in rural King County, they’d probably start even earlier.) They were on site at North Beach Park and had done a good bit of unloading by the time I showed up at 8:45. The plan for the morning was that one group would transport mulch down into the park, staging it for a bucket brigade in the afternoon. The other crew would do some planting on the slope we would be mulching. 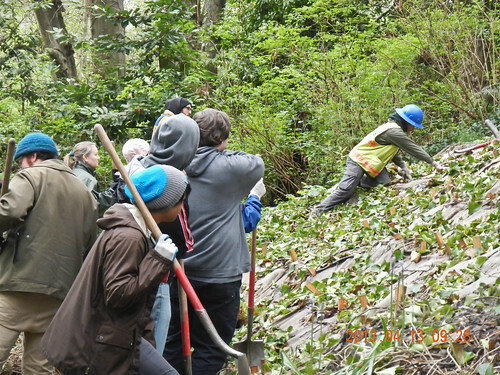 Then crews would switch, and transport crew would do some invasive removal and the planting crew would do transport. 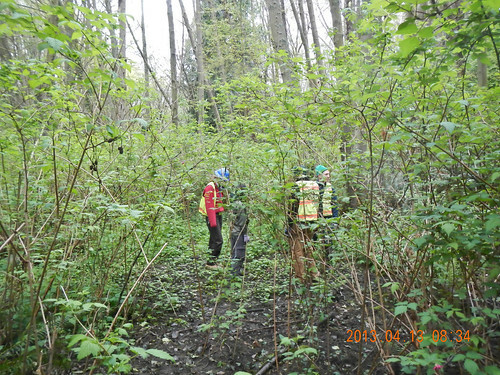 Here are the EarthCorps folks inspecting a possible worksite that turned out to be relatively invasive free. Also, as you can see, it would have been crowded working in there. We found another spot. People started arriving a little before 10, so we were able to get going pretty promptly. Masha explaining the plans for the day. The attentive group. It was cold in the morning, but soon enough everyone warmed up. 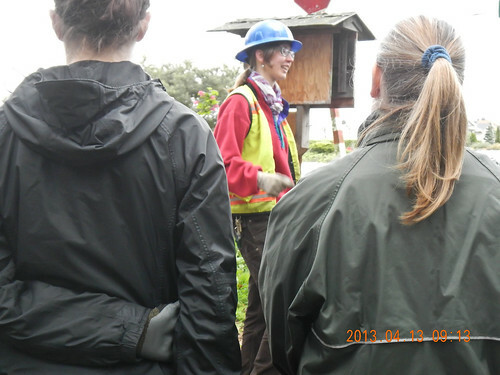 Jessa gives a planting demonstration. 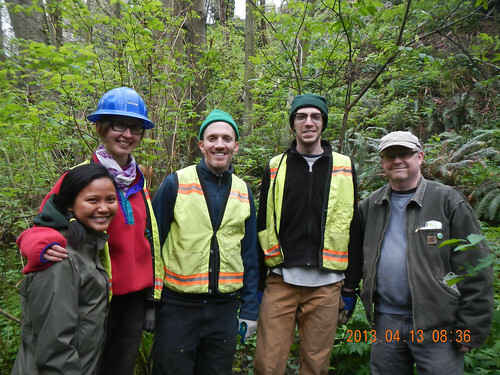 The planting crew planted quite a lot: sword fern and red flowering currant on the hill, sitka spruce and oregon ash in the wetlands. Ethan leads a group cleaning up the mulch staging site. And here comes the mulch! 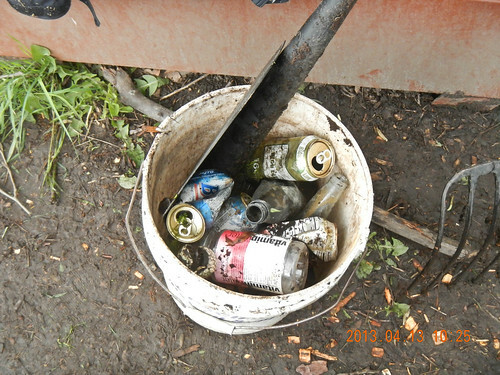 Some of it came by bucket, some by wheelbarrow. It was about 450 feet down the trail. Getting it down there was easy, the walk back up the trail was the hard part. Once all the planting was done, the planting and mulch transport crews switched tasks. Here’s a sign of success: All those people all over the park, and only a small bucket of trash came out. And one tire. As an example, everything to the right of the blue tarps is a trash pile from two work parties a year ago. That’s what we used to find every time we worked in the park. 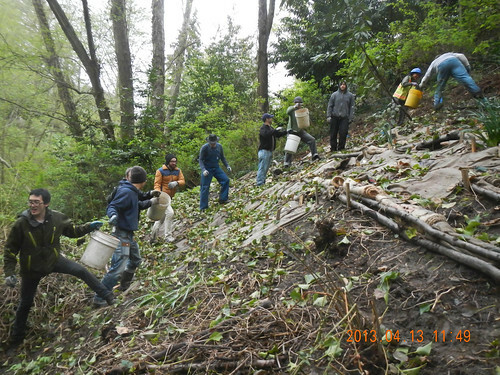 Invasive removal crew, at the base of the slope in the Headwaters Bowl. Note: The man in the t-shirt is probably working harder than the people in hoodies and jackets. But we’re not here to judge. 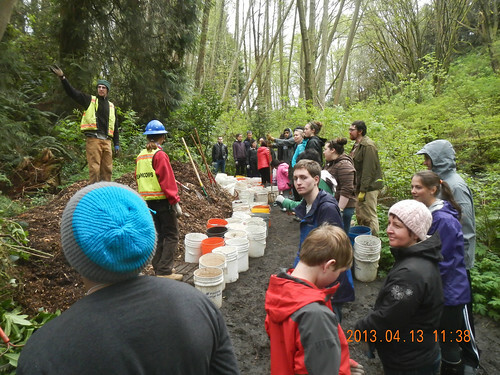 In the afternoon, EVERYONE participated in the bucket brigade. 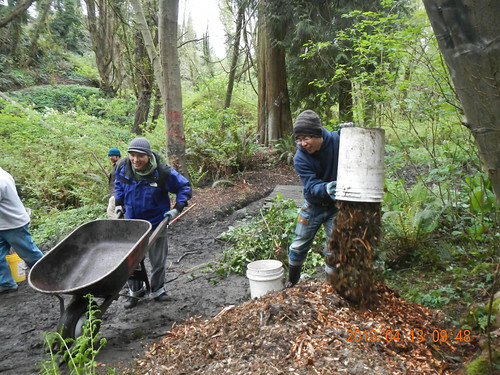 This is exactly what I wanted a large work party for: the slope needed to be mulched, and the best way to do it was with a bucket brigade. This picture is taken from very near the start of the bucket brigade. 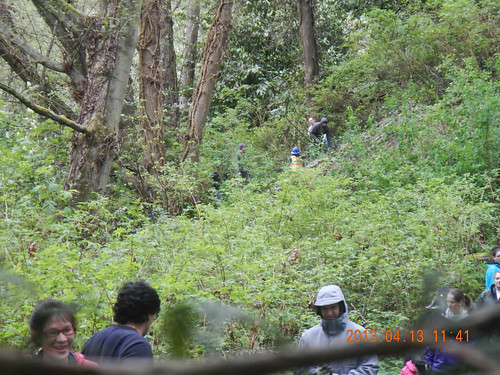 The people in the background are at the end, about 200 feet further down the trail. 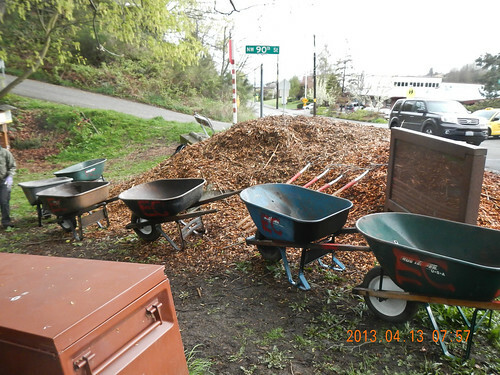 The slope has been covered in two layers of burlap, and now receives a finishing touch of 6-12″ of wood chip mulch. 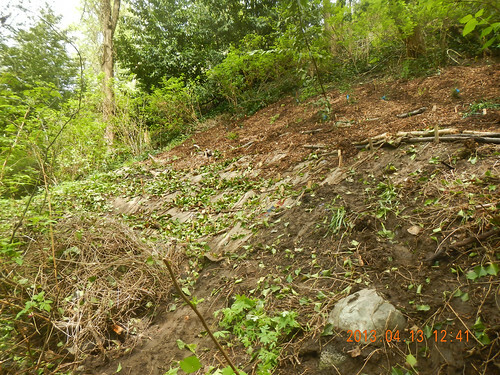 This will help suppress ivy resurgence and prevent soil erosion. High fives at the end of the day! Here’s what the mulched area looks like. Nice! There are about ten trees and several shrubs in there. 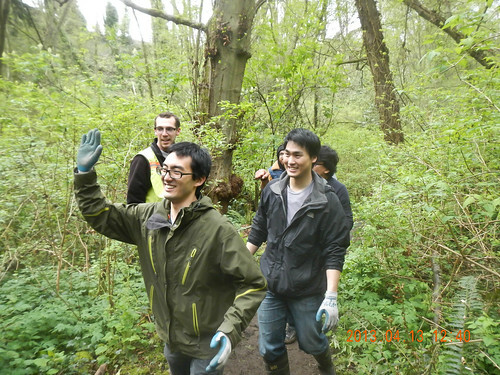 I want to thank EarthCorps and everyone who attended the work party for all the great work done. It was truly a pleasure. 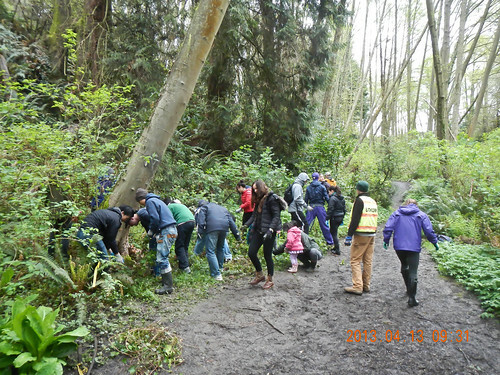 Friends of North Beach Park will have our regular 4th Saturday work party on April 27. The next EarthCorps event will be in June or July, but don’t worry, we’ll give you plenty of fore-warning. Mirrored from Nature Intrudes. Please comment over there.